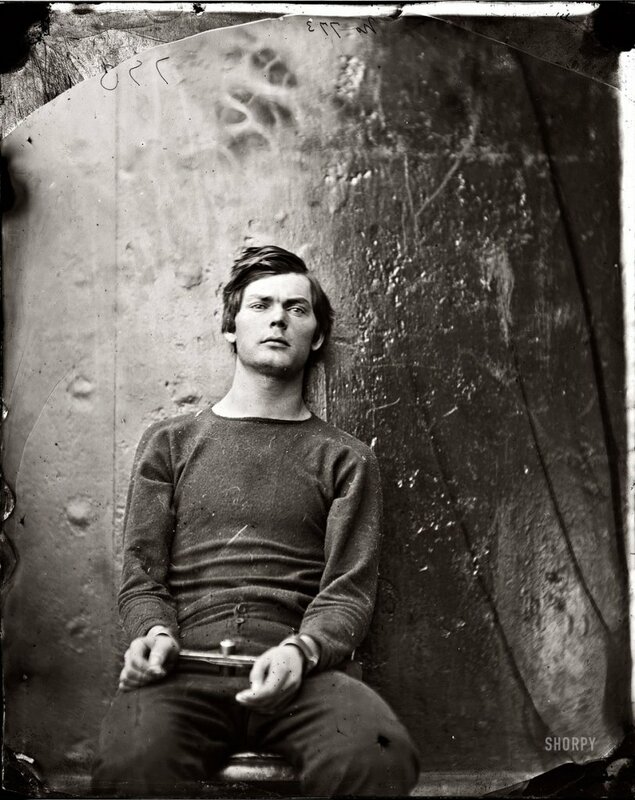 Lewis Payne, seated and manacled, at the Washington Navy Yard about the time of his 21st birthday in April 1865, three months before he was hanged as one of the Lincoln assassination conspirators. View full size. Photograph by Alexander Gardner, probably taken aboard the ironclad U.S.S. Montauk or Saugus. About Lewis Payne and his muscles. Submitted by Maniak Productions on Fri, 08/05/2011 - 12:20pm. It was reported that his neck muscles were so strong, that he died solely from asphyxiation. None of the bones in his neck were out of place when they cut him down. Submitted by noelani on Mon, 11/29/2010 - 1:25pm. When I was 13, I read "Love is Eternal" by Irving Stone, which is a very romantic, historic novel about the lives of Abraham Lincoln and Mary Todd Lincoln. I was a weird kid. While my friends all had crushes on Davy Jones, I fell in love with Abe Lincoln and couldn't get enough information about him. Several of the photos of the conspirators have haunted me, ever since, but none so much as this one of Lewis Payne. I think the fact that he was a very handsome young man makes it stick in one's mind more easily, but the look on his face speaks volumes. He obviously did not think of himself as a cold-blooded killer. He saw himself as a prisoner-of-war; a martyr for a noble cause. As far as comparison with actors, I don't see Toby Maguire as much as I see actor Patrick Fugit, as an adult. Submitted by Anonymous Tipster on Sun, 08/29/2010 - 9:39pm. I was just looking up historical pics of the D.C. Navy Yard and came across this. First reaction was an okay *shrug* because I didn't know who it was until I read the caption and now I find it slightly chilling. Submitted by Anonymous Tipster on Thu, 10/08/2009 - 10:01am. Contemporary accounts note that women were "thrilled" by Lewis Payne's well-muscled form. I don't see that at all; he looks like a very lean young man. Submitted by Anonymous Tipster on Wed, 07/01/2009 - 10:58am. The ironclad was selected for the conspirators until permanent arrangements could be made. A ship had limited access (gangway)and hence relative ease of security. It also facilitated movement to another venue if needed. Sec. Stanton didn't want the individuals torn apart by a crowd who, it occurs to me, might have thought to swarm the entrance to a military prison. An armed vessel was a pretty good solution. Submitted by Anonymous Tipster on Tue, 06/30/2009 - 10:24pm. Am I the only one who has seen THE FACE above Mr. Payne! While watching Nightwatch and hearing Nick Nolte tell Ewan who was in the picture, I had to Google. Always intrigued by the pic and movie, now more so.. Submitted by Anonymous Tipster on Mon, 06/22/2009 - 7:21pm. Looks like a Calvin Klein ad. As do the other pictures in the Payne series. When I see a period film hear people say that a person doesn't look like they belong in the prescribed period, I ask them why they think so. If it has something to do with the hairdo (like Faye Dunaway in Bonnie and Clyde) then I have to agree. But if the person says that the actor's face doesn't belong in the picture, I show them this picture and ask them if they have seen this Calvin Klein ad. They ask when it was shot, say circa 1992. Then I drop the bomb and tell them that it was taken in April or May 1865. Shuts 'em up every time. Submitted by Anonymous Tipster on Wed, 04/29/2009 - 3:47am. I am a photojournalist and the lighting and look in this photograph is just amazing. Submitted by Anonymous Tipster on Fri, 10/26/2007 - 4:44pm. It's interesting that he is wearing a U.S. Navy shirt and trousers. Obviously an ad hoc prison uniform while aboard an ironclad. Submitted by Anonymous Tipster on Thu, 07/19/2007 - 1:38am. Death must have been a relief after having to be shackled in those for months. That look in his eyes, it's mesmerizing. Submitted by Anonymous Tipster on Mon, 06/18/2007 - 2:28am. I remember the picture was also featured in Ken Burns' documentary The Civil War. Imagine being in rigid irons for months. I'd go insane. Submitted by Anonymous Tipster on Sun, 05/13/2007 - 8:26pm. I *knew* I recognized this picture as soon as I saw it. It was featured in Roland Barthes' book "Camera Lucida" about photography. Sort of random, but if anyone wants to read a high falutin' book that deals with this photo, you should look it up. He really does look like Tobey Maguire doesn't he? The Handcuff in this picture is a "Lilly Iron".. Submitted by Anonymous Tipster on Sat, 05/12/2007 - 6:01pm. Submitted by Anonymous Tipster on Tue, 05/08/2007 - 8:27am. Can anyone tell me what that backdrop is? It looks like a huge sheet of steel or lead. Submitted by Anonymous Tipster on Mon, 05/07/2007 - 6:01am. He looks like Tobey Maguire. Submitted by Anonymous Tipster on Fri, 05/04/2007 - 10:46pm. Submitted by Anonymous Tipster on Fri, 05/04/2007 - 8:56pm. too bad he's a stone cold killa. and now the rest of the story.. Submitted by Anonymous Tipster on Fri, 05/04/2007 - 2:57pm. Payne had been detailed to murder Secretary of State Seward as his role in the plot. Seward had been in an accident days before and was in bed wearing a metal neck brace. Payne attacked him with a Bowie knife in the darkened bedroom, slashing him several times. But for the brace, he would have cut Seward's jugular, killing him. Submitted by Anonymous Tipster on Fri, 05/04/2007 - 11:44am. Submitted by Anonymous Tipster on Fri, 05/04/2007 - 7:50am. Submitted by Anonymous Tipster on Fri, 05/04/2007 - 6:44am. This picture was featured in the 1997 Ewan McGregor film Nightwatch. It was hanging on the wall of the Watchman's office of a morgue and becomes the object of Ewan's obsession.